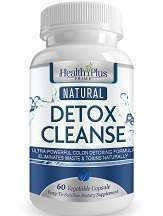 What is Health Plus Prime Natural Detox Cleanse? Health Plus Prime Natural Detox Cleanse claims to be a safe and natural way to rid your body of toxins and waste that have built up over time. This product offers a safe and gentle way to cleanse the colon, as many other methods of detoxification are harsh on the body. Natural Detox Cleanse not only eliminates unnecessary toxins, but it can also aid in weight loss, make you feel lighter and refreshed, and provide the quick results that you want. Natural Detox Cleanse does not contain any fillers, binders, artificial ingredients, titanium dioxide, wheat, gluten, soy, egg, shellfish, milk, or peanuts. It is recommended to take 1 or 2 tablets of Natural Detox Cleanse in the morning, and an additional 1 or 2 tablets in the evening. You should begin with 1 tablet for the initial first few days and increase to 2 tablets when you feel comfortable. Each tablet should be taken with a full glass of water. The manufacturer, Health Plus Prime, also recommends two cleanses per year. There is no indication for how long the product should be taken for. One bottle of Natural Detox Cleanse (containing 60 tablets) is usually priced at $39.99 on the manufacturer’s website, but is currently on sales for $5.00. The manufacturer offers free shipping on all orders within the U.S. This product is also available on other websites for varying prices, but the best price is directly through the manufacturer. The manufacturer states that if you’re pregnant or nursing, under the age of 18, or have a previous medical condition, you should speak with your healthcare provider prior to using the product. It is also cautioned not to exceed the recommended dosage (1-2 tablets in the morning, and 1-2 tablets at night). If you have abdominal pain, diarrhea, or loose stools, you should discontinue use of Natural Detox Cleanse. Health Plus Prime is fully confident in the quality of their products and offers a 60-day, 100% money-back guarantee. The manufacturer also offers in-house experts that can work with customers to provide advice on how to make the most of their products and live a healthier life. There are also ample amounts of reviews across the manufacturer’s site to help determine the effectiveness of the products. Natural Detox Cleanse offers a safe and gentle alternative to the sometimes harsh ways of cleansing the colon. The manufacturer’s website provides reviews for this product, as well as offering a money-back guarantee, showing their confidence in Natural Detox Cleanse. While they offer reviews of their products, this specific product has very few, making it difficult to determine its effectiveness. Although the price is currently only a mere $5, the normal price of $39.99 is high. It may be beneficial to explore other colon cleansing options on the market that are more affordable.